There’s lots of talk about the democratization of fashion these days. But making great style accessible to everyone usually has more to do with affordable price points than anything else. And while more and more designers are warming up to the idea of dressing all body types, the furthest they consider venturing is into the plus size realm. That’s why Toronto’s Izzy Camilleri is such a treasure. She first came on the scene back in the mid ‘80s, making her mark as an innovative designer and expert craftswoman who specialized in fantastic leather pieces, spectacular evening wear, and custom corsets. The statement-making clothes she created for me back in the day never failed to turn heads, from the black and white satin Pierrot costume inspired by a Fashion Cares circus-themed gala, to the python biker jacket I wore to the Toronto premiere of The Lion King in 2000. Izzy has done a lot of impressive custom work for movies as well, including the silver fox coat that Meryl Streep wore in ‘The Devil Wears Prada’. And more recently, Izzy launched a line of luxury furs under the IZMA label. But it was her relationship with Toronto Star writer Barbara Turnbull, a wheelchair user since 1983, that gave Izzy the chance to explore fashion design on a whole other level. Besides the unparalleled satisfaction Izzy found in creating custom garments for Barbara, the exercise was the genesis of a whole new line of adaptive clothing. And a whole new mindset. “There is so much fashion out there,” noted Izzy, when I dropped by her bright Dundas West showroom recently. “And you and I have so many options; we have too many options,” she opined. “This market has practically none. So for me to put my energy and my talents here…. it feels really good both professionally and personally,” she shared. When Izzy first started working with Barbara Turnbull about 8 years ago, she’d never designed for someone in a chair. “I didn’t realize that there were any differences in terms of clothing between someone who’s able bodied and someone who’s not. Barb opened my eyes to the issues that she had, and I just started becoming a sponge and listening to all her clothing problems,” Izzy recollected. Because the needs of “seated clientele” are often overlooked, Izzy made it her business to do her research, and learn first-hand about the specific requirements people have when they have to go through life sitting down. 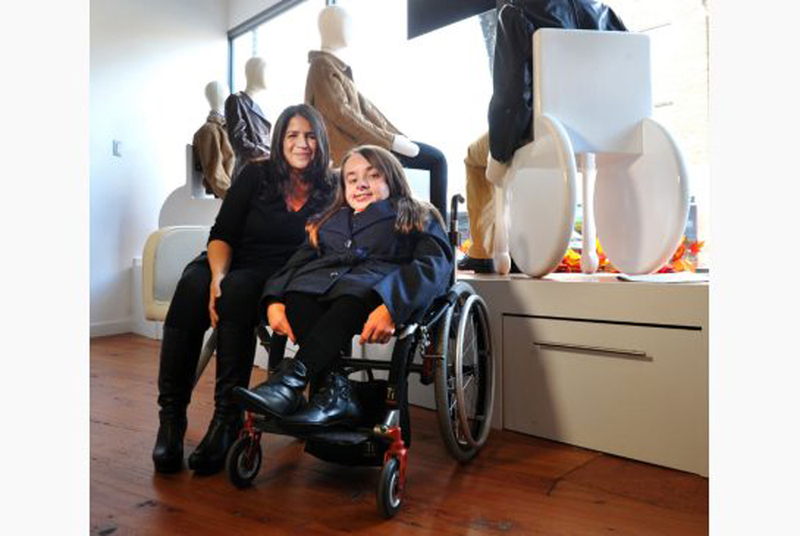 After six years of listening and learning, Izzy launched her IZ Adaptive Clothing line. Always a talented pattern maker, Izzy claims she’s developed a formula for the kinds of things that work best for those in wheelchairs, and she now boasts around 80 styles which her female and male clients can choose from. I have an idea of how challenging and frustrating searching for just the right clothing can be for someone who’s not only confined to a wheelchair, but who also isn’t a conventional size. 24 year-old Morgan Dumas is the vivacious daughter of one of my best friends, Toronto realtor Diti Dumas. Morgan was born with osteogenesis imperfecta, or “brittle bones”, and because of her rare condition, her bones haven’t developed properly. She’s spent most of her life in a wheelchair. But the spirited Morgan is unstoppable, and recently wowed us all by graduating in journalism from Ryerson. Morgan grew up with my girls and we can all attest to the fact that she’s an avid shopper—though she has an understandably tough time finding things that fit her properly. Just about everything has to be altered. For Morgan’s recent graduation, my daughters and I decided a custom garment from IZ Adaptive Clothing would make the perfect gift. So we treated Morgan to an Izzy “couture experience”. But as thrilling as it all was for Morgan, the sweetest part for me was being there to watch her try on her new custom garment. Her excitement was palpable. She was glowing. And I was reminded of just how good fashion can make us feel—especially when it fits just right. Here’s Morgan’s diary account of what went on. This afternoon, I travelled to IZ Adaptive where I met designer, Izzy Camilleri. After Izzy gave me some background information on her company, she led me to the racks of clothing in her showroom. Although all the clothes looked great, what really caught my eye was something I had always dreamed of owning but was never able to find: a knee length wool trench coat. I fell in love with this piece and knew I wanted Izzy to create this for me. Izzy then gave me the choice of four colour swatches of wool: red, black, caramel or dark grey. I knew right away the grey was the perfect choice because I loved how it was classic and chic. Izzy led the way to the fitting room to take my measurements, which was a new experience for me because I had never been fitted like this for clothes. Izzy was very informative in explaining why she needed each measurement and since I had chosen a coat, she only had to measure the upper half of my body. She also measured the length of my knees since I wanted the coat to cover me when I wear dresses. Once finished, Izzy allowed me to peak into the workshop area where the clothes are made on site. When I left, I couldn’t stop smiling at the thought of having a custom trench coat that would actually fit me properly, unlike the other coats I had in the past. I met with Izzy at her studio for my first fitting and when I arrived she led me straight to the fitting room. Since the coat was not finished and the lining had yet to be attached, Izzy assisted me with getting it to fit how it should once the buttons and belt were eventually sewn on. The one thing I noticed when I put on this coat was how the back was slightly shorter than the front, which made it much easier to put on and fit around me while sitting in my wheelchair. Izzy then began to insert pins in various places to mark where I wanted the buttons. Her first question to me was whether I wanted two buttons or three. At first I was not sure, but then I decided it was better to have three in order to allow for more flexibility and warmth. Next, she asked how the sleeves fit and although they fit well, I decided in order to keep warm; I preferred to have a bit longer sleeves. Finally, she double-checked the measurement of my waist to ensure the right place to sew on the loops for the belt. When all the necessary pins had been inserted, Izzy carefully helped me take off the coat to make sure I did not pinch myself or lose any of the pins. As I left the studio, I was even more excited as my coat was no longer just a theoretical concept, but rather an amazing work in progress. Thursday November 17, 2011: GARMENT PICK-UP! When I arrived at IZ Adaptive early this afternoon for the unveiling of my coat, Izzy was waiting near the door and welcomed me inside. Once Jeanne and the Fashion Television crew arrived, Jeanne interviewed Izzy and asked me a few questions at the front of the store and then Izzy brought out my new coat. Although slightly unsure at first on what everyone would think of how I put on my coat, I was encouraged to do so, even though I don’t put it on in the most conventional way. I slipped my arms through the coat and then flipped it over my head and around my back, the easiest way for me to get on my coats. I then tucked it around me, did up the buttons and tied the belt. At first I was speechless because I never had a coat fit so great and look so wonderful. Izzy then questioned whether everything looked and felt as I had hoped and I was very happy to report, not only did it fit and look perfect, it was truly amazing to have an item of clothing, especially a coat fit me so effortlessly. This afternoon, I traveled to IZ Adaptive where I met designer, Izzy Camilleri. After Izzy gave me some background information on her company, she led me to the racks of clothing in her showroom. Although all the clothes looked great, what really caught my eye was something I had always dreamed of owning but was never able to find: a knee length wool trench coat. I fell in love with this piece and knew I wanted Izzy to create this for me. Izzy then gave me the choice of four colour swatches of wool: red, black, caramel or dark grey. I knew right away the grey was the perfect choice because I loved how it was classic and chic. Izzy led the way to the fitting room to take my measurements, which was a new experience for me because I had never been fitted like this for clothes. Izzy was very informative in explaining why she needed each measurement and since I had chosen a coat, she only had to measure the upper half of my body. She also measured the length of my knees since I wanted the coat to cover me when I wear dresses. Once finished, Izzy allowed me to peak into the workshop area where the clothes are made on site. When I left, I couldn’t stop smiling at the thought of having a custom trench coat that would actually fit me properly, unlike the other coats I had in the past. I met with Izzy at her studio for my first fitting and when I arrived she led me straight to the fitting room. Since the coat was not finished and the lining had yet to be attached, Izzy assisted me with getting it to fit how it should once the buttons and belt were eventually sewn on. The one thing I noticed when I put on this coat was how the back was slightly shorter than the front, which made it much easier to put on and fit around me while sitting in my wheelchair. Izzy then began to insert pins in various places to mark where I wanted the buttons. Her first question to me was whether I wanted two buttons or three. At first I was not sure, but then I decided it was better to have three in order to allow for more flexibility and warmth. Next, she asked how the sleeves fit and although they fit well, I decided in order to keep warm; I preferred to have a bit longer sleeves. Finally, she double checked the measurement of my waist to ensure the right place to sew on the loops for the belt. When all the necessary pins had been inserted, Izzy carefully helped me take off the coat to make sure I did not pinch myself or lose any of the pins. As I left the studio, I was even more excited as my coat was no longer just a theoretical concept, but rather an amazing work in progress.